The Wacky Wednesday Halloween countdown continues. This week we're going to take a look at the Halloween legacy of Dickie Goodman. Goodman was a record producer who, beginning in the 1950s, worked for many popular artists including Bobby Darin, Frankie Lymon and The Del-Vikings. But he also was known as a songwriter and performer of novelty songs. He's most famous for what is known as the "break-in" song. For nearly 20 years beginning in 1956 with "The Flying Saucer," (performed with fellow songwriter Bill Buchanan, Goodman made the charts with several of these records. Basically, they were weird little skits in which Goodman played a radio reporter interviewing people. The answers would come in the form of short snips of songs that were currently or recently popular. My favorite of these was in 1975's "Mr. Jaws," where Dickie asks the shark why he's biting his hand. The answer is a line from Melissa Manchester's pop hit "Midnight Blue." "Wouldn't you give a hand to a friend? ..."
Indeed, though most of these break-in songs were unabashedly stupid and frequently annoying, Goodman was something of a record-sampling pioneer. 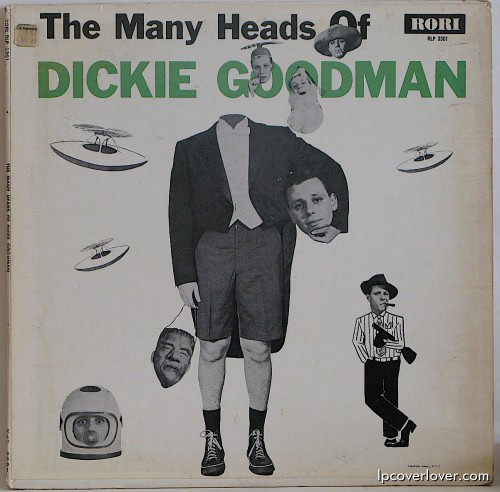 Dickie Goodman was sued by 17 record labels for copyright infringement in 1956 because his hit record, "The Flying Saucer" (a satire about the UFO phenomenon) contained short samples of several other hit records. After hearing the record with Dickie Goodman narrating while Elvis and Little Richard sang about Martians landing on Earth, NY Supreme Court ruled that a new work had been created and as long as the samples were paid for, no infringement existed. "Mr. Jaws" in 1975 was the last real hit for Goodman. Fourteen years later, he ended his life, shooting himself in the head. With that morbid detail, let's get back to Halloween. A pop-culture wizard like Goodman would not want to ignore the resurgence of popularity for movie monsters in the 1960s. Beginning in the previous decade, local TV stations created local celebrities in the form of Vampira, Tarantula Ghoul, Zacherley, Count Gregor and untold other hosts of late-night horror shows. The popularity of monster movies continued into the '60s. Bobby "Boris" Pickett's "Monster Mash" was a graveyard smash. Every male kid I knew back in the early to mid '60s bought up the Aurora company's plastic models of Frankenstein, The Wolfman, Dracula and The Mummy. Famous Monsters of Filmland became must-read material. So how could Goodman not pass up the opportunity to cash in on the monster craze? Here are some of Dickie's monster melodies for this Halloween season. True, some of them make Bobby "Boris" Pickett seem like Cole Porter, but what the heck? Let's dance to the "Werewolf Waltz"
Here's Goodman's Halloween take on The Coasters' "My Baby Loves Western Movies"
Finally, here's the one I remember from my childhood. My mom got the early version of Goodman's The Monster Album for my brother and me. Even back then when I was in grade school, it seemed pretty tacky and corny. And the tackiest, corniest, dumbest song on the record was "Frankenstein Meets the Beatles." The pairing was obvious, as Dickie explained in the lyrics: "Well, they screamed for The Beatles and they screamed for Frank, but it wasn't the very same kind ..."
And here is a later version of The Monster Album, including some horror-related break-in tune, some modern offerings from Goodman's son and some songs that don't appear to have any reason to be there at all.